Black Rock is the sister range to Red Rock designer furniture and offers a steel leg with wooden cladding for a warmer and richer aesthetic. There are two versions the first has 18mm thick MFC tops in a choice of four contemporary finishes which contrast well with the traditional Oak finish of the leg. 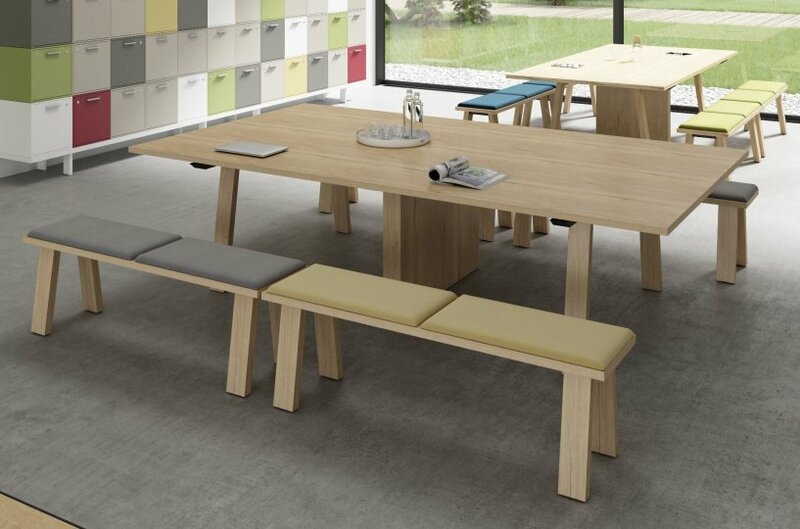 The second all wood option offer s 30mm thick top matching the leg frame for a stylish and rich design effect that is equally at home in canteen and dining settings as well as an office bench desk solution. This range shares storage models from its sister range and therefore same proximity storage solutions are still available. Designed and manufactured in Italy these designer ranges come with a five year factory guarantee and are made to a high standard. As always please do not hesitate to take advantage of our free, in house professional interior design and space planning service.